The Foxglove Trio seek out lesser-known traditional and contemporary folk songs and, with care and creativity, transform them into moments of breathtaking beauty. Since forming in 2010 these talented musicians have built a powerful signature sound based on Patrick Dean’s bold melodeon playing, Cathy Mason’s intricate cello lines and Ffion Mair’s clear, soaring vocals. 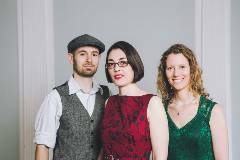 The Foxglove Trio’s intriguing repertoire and imaginative arrangements are presented with an infectious energy and an effortless charm. Their passionate performances will captivate you and take you on a journey from subtly political contemporary songs to jaunty Yorkshire tales and soulful Welsh laments.